Physicians and health care organizations are still moving slowly to offer chronic care management (CCM) services to their Medicare patients under a reimbursement program that began in January. A new survey(www.pyapc.com) found that only 26 percent of respondents said they or their organizations had launched a CCM program by late summer. Of those, slightly less than half said they had successfully submitted a claim and been paid. Under CCM, a practice can receive additional reimbursement for providing non-face-to-face services to Medicare patients with two or more chronic conditions. The practices must meet a number of requirements, including documenting at least 20 minutes of service per patient per month. Pershing, Yoakley & Associates, a health care consulting firm, and Enli Health Intelligence conducted the survey between Aug. 3 and Sept. 21. Researchers used responses from 309 clinical, administrative, and financial staff. Despite the low number of early CCM adopters, the respondents indicated there was interest in the program. Almost two-thirds said they or their organizations had analyzed the program and 23 percent said they intended to launch a program within 12 months. Eleven percent said they had no plans to participate in CCM. Respondents said the main obstacles to participating included payment amounts that don't cover the additional time and effort required to offer the services. In fact, respondents who were already offering CCM reported providing a median of 35 minutes of services per patient per month, not 20. They also blamed a lack of awareness about CCM and concerns about the steps needed to show compliance. Sixty percent of respondents also were worried that they would have to hire additional staff to handle CCM duties. Among those who had already started a CCM program, most were from large organizations. 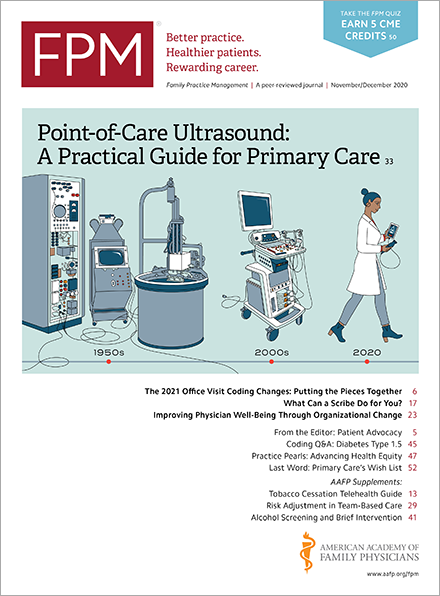 For example, 18 percent of practices employing between one and five physicians were providing a CCM program compared with 38 percent of organizations employing more than 100 physicians. Small organizations reported lack of infrastructure, organizational support, and familiarity with the program as being the primary barriers to adoption. Small organizations that were offering CCM also experienced less patient resistance and higher levels of physician engagement compared with larger organizations.